Ecuador v. United States Inter-State Arbitration under a BIT: How to Interpret the Word “Interpretation”? There is an inter-State arbitration pending between Ecuador and the United States under the Bilateral Investment Treaty (BIT) between those two countries (Treaty between United States of America and the Republic of Ecuador Concerning the Encouragement and Reciprocal Protection of Investment, 27 August 1993). The Ecuador v. US case , which was initiated in June 2011, is, as far as I am aware, a very very rare instance of inter-State arbitral proceedings under a BIT. As is well known, one of the main purposes of BITs is to give investors the right to bring claims against the host state of investment. This feature of BITs, and the vast number of such treaties, has meant that investor-State arbitrations under BITs have replaced diplomatic protection as the primary means of settling investment disputes. There have been hundreds of investor-State proceedings before arbitral tribunals. However, BITs also contain compromissory clauses by which disputes concerning the interpretation or application of disputes under these treaties can be brought before arbitral tribunals established under the BIT. The only other inter-State BIT cases that I am aware of are the recent Italy and Cuba cases which were discussed in the April 2012 issue of the American Journal of International Law. In general, States leave it to the investor to protect its rights under the BIT. The present proceedings brought by Ecuador are particularly interesting for a couple of reasons: one specific to investment law, the other relating to general international law. First of all, as the case arises out of Ecuador’s dissatisfaction with the interpretation given by an earlier investor-State arbitral tribunal (Chevron and Texaco Petroleum Company v. Republic of Ecuador, Partial Award, 30 March 2010) to a particular provision of the Ecuador – US BIT, the case may be construed as a way by which Ecuador is trying to use the inter-State procedure as a way of appealing the results of a case brought under the investor-State procedure. There have been concerns by many that there is no appellate procedure in the investment treaty system and this case seems to be an attempt to create one. Max du Plessis, Visiting Fellow at the Oxford Institute for Ethics, Law and Armed Conflict. He is an Associate Professor, University of KwaZulu-Natal, Durban; Senior Research Associate, International Crime in Africa Programme, Institute for Security Studies; and a Barrister, South Africa. At their latest African Union (AU) Assembly meeting, held in July, African Heads of State were asked to adopt a draft amended protocol on the Statute of the African Court of Justice and Human Rights (hereafter ‘African Court’) which would have expanded the jurisdiction of the African Court to include the competence to prosecute individuals for international crimes. The draft protocol would have created an International Criminal Law Section of the African Court with criminal jurisdiction over the international crimes of genocide, war crimes and crimes against humanity, as well as several transnational crimes such as, terrorism, piracy, and corruption. Thankfully, the Heads of States decided not to adopt the amended protocol at that meeting and to postpone consideration of this proposal. Of course, we should all applaud if the AU were in due course to unveil a comprehensively funded, strongly resourced, legally sound, and politically backed African court that fearlessly pursues justice for those afflicted by the continent’s warlords and dictators, at the same time as fulfilling effectively its parallel human rights roles. However, given (i) the process by which the draft protocol had been put together thus far, and (ii) the contents of the draft protocol, the creation of an effective court had seemed unlikely. More time was needed to consider various aspects of the proposals and one can only hope that the time that has been afforded by the postponement of consideration of the protocol will be used wisely. This post deals with the flawed process that had been adopted as well as some concerns regarding the content of the draft amended protocol. I expand on these issues in a recent paper for the Institute for Security Studies. So, you want to do a PhD in international law? This will be a longish post, and you probably think: ‘Ah, this will be about writing a killer application to my preferred school!’ Yes, that will be covered briefly. But first, grab a seat, we need to share a few home truths – and ask some hard questions. I am delighted to report that Oxford University Press have recently published International Law and the Classification of Conflicts which is edited by Elizabeth Wilmshurst and which I contributed a chapter to. 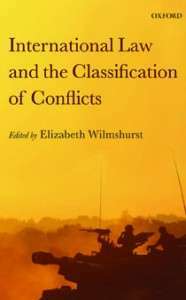 This book comprises contributions by leading experts in the field of international humanitarian law on the subject of the categorisation or classification of armed conflict. It is divided into two sections: the first aims to provide the reader with a sound understanding of the legal questions surrounding the classification of hostilities and its consequences; the second includes ten case studies that examine practice in respect of classification. Understanding how classification operates in theory and practice is a precursor to identifying the relevant rules that govern parties to hostilities. With changing forms of armed conflict which may involve multi-national operations, transnational armed groups and organized criminal gangs, the need for clarity of the law is all-important. The case studies selected for analysis are Northern Ireland, DRC, Colombia, Afghanistan (from 2001), Gaza, South Ossetia, Iraq (from 2003), Lebanon (2006), the so-called war against Al-Qaeda, and future trends. The studies explore the legal consequences of classification particularly in respect of the use of force, detention in armed conflict, and the relationship between human rights law and international humanitarian law. The practice identified in the case studies allows the final chapter to draw conclusions as to the state of the law on classification. My own chapter, “Classification of Armed Conflicts: Relevant Legal Concepts“, provides an overview of how and why international law classifies situations of violence for the purpose of application of international humanitarian law. The chapter examines the distinction between international and non-international armed conflicts as well as the distinction between armed conflicts and situations of violence that do not qualify as armed conflicts. The chapter examines the history of the distinction between the two categories of armed conflict, the consequences of the distinction and whether the distinction still has validity. The chapter discusses the meaning of the concepts of ‘international armed conflict’ and ‘non-international armed conflict’, including the legal standards by which such qualifications are to be made. Particular attention is paid to foreign intervention in non-international armed conflicts, extraterritorial hostilities by one State against a non-state armed group and conflicts in which multinational forces are engaged. I quoted extensively from that chapter in one of my previous posts on extraterritorial conflicts with non-State groups. Roger O’Keefe is Deputy Director, Lauterpacht Centre; University Senior Lecturer in Law, University of Cambridge and Fellow & College Lecturer in Law, Magdalene College, Cambridge. We only have Ecuador’s word for it that the UK government has made this ‘threat’, and we should be cautious in accepting this without corroboration. But let us assume for the sake of argument that the allegation is true. The main enactment alluded to in section 1(3) is the Diplomatic Privileges Act 1964 (‘DPA’), which enacts into UK law certain provisions of the Vienna Convention on Diplomatic Relations 1961 (‘VCDR’), among them article 22(1), which codifies the rule that the premises of a diplomatic mission are inviolable. The inviolability of diplomatic premises means, among other things, that the authorities of the receiving state (here, the UK) may not enter the mission’s premises, except with the consent of the head of the mission. (This does not, contrary to popular misconception, make the embassy premises Ecuadorian territory. The premises remain UK territory, albeit UK territory that the UK authorities are not allowed by the DPA to enter without permission.) In short, the UK authorities may not enter the Ecuadorian embassy without the permission of the Ecuadorian ambassador—provided, that is, that the embassy premises remain diplomatic premises. The suggestion would seem to be that the Ecuadorian embassy has ceased or will cease to be diplomatic premises within the meaning of section 1(3) DCPA and article 22(1) VCDR. There are two possible ways this could be argued to have happened or to happen. Gabriella Citroni is Senior Researcher in International Law and Lecturer in International Human Rights Law at the University of Milano-Bicocca. Although she is Senior Legal Adviser for TRIAL, a Switzerland based NGO that filed the criminal complaint in the case discussed below, she has not been involved in this case. On 25 July 2012 the Swiss Federal Criminal Court issued a decision (which is available, in French, here) whereby it denied the existence of immunity ratione materiae for a former Algerian Minister of Defence accused of war crimes. This decision revives the ongoing debate on the sensitive issue of immunity of State officials from foreign criminal jurisdiction and opens up for new perspectives for the application of the principle of universal jurisdiction. It also deals with other relevant matters related to the struggle against impunity. On 19 October 2011, TRIAL, a non-governmental organization active in the field of human rights headquartered in Switzerland filed a criminal complaint against Mr. Khaled Nezzar, accusing him of war crimes committed during the Algerian civil war (1992-2000). On 19 and 20 October 2011, two individuals of Algerian origin enjoying the status of refugees in Switzerland (one of whom acquired Swiss nationality), also filed criminal complaints against Mr. Nezzar, alleging that they were subjected to torture in 1993. Mr. Khaled Nezzar, a former general, was Chief of the Algerian Army in 1988, later promoted to Chief of Staff and subsequently appointed as Minister of Defence. During the same period he also was a member of the “High Council of State” (Haut Comité d’Etat, hereinafter “HCE”), which was a collegial body established on 14 January 1992 to replace the President. The HCE functioned until January 1994 and during this period it was entrusted with “all the powers attributed by the Constitution to the President of the Republic”.